Aberdeen & Rockfish Railroad Co. (A&R) soon will mark its 125th anniversary. The company was founded on June 22, 1892. The short line operates about 50 miles of track in three North Carolina counties and Marlboro County, S.C., and interchanges with CSX and Norfolk Southern Railway. The short line's long survival can be traced to both consistency and adaptability, A&R officials said in a press release. The railroad has constantly adapted to a changing economy that has shifted its loads from timber to agricultural crops to chemicals, forged partnerships with trucking companies and much larger connecting railroads, and taken over other short lines to diversify its revenue, they said. "With unwavering support from the founding Blue family, the loyalty of employees who often span generations, and the same landmark headquarters building since 1904, A&R has been consistently profitable while hundreds of short line railroads throughout the state and nation have disappeared," A&R officials said. Founder John Blue guided A&R as a civic-minded company, and three of its presidents served as the mayor of Aberdeen, N.C. Launched in the midst of a national recession in 1892, the railroad served the family turpentine and timber business, running from Aberdeen through pine forests. Originally planned to terminate along Rockfish Creek — hence the short line's name — the A&R changed its early routes several times, removing and reusing abandoned track. Without the founding family's long-term dedication, A&R would have been sold or abandoned its tracks, "and this part of North Carolina would have lost rail service," said Garland Horton, the railroad's eighth president. A&R expanded its reach twice in the 1980s by taking over two short lines. 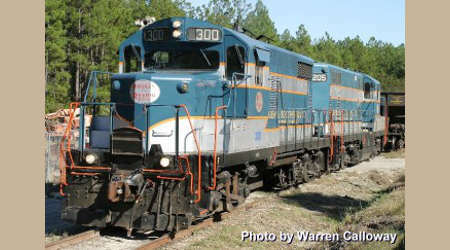 In 1987, the railroad began operating the former 15-mile Pee Dee River Railway after Marlboro County officials purchased the line between Marlboro and McColl from CSX and contracted A&R as the long-term operator. Also in 1987, A&R acquired the Dunn-Erwin Railway — which floundered when a denim plant closed in the early 1990s due to overseas competition — removed its five miles of track, and donated the route to local government as a nature trail. More recently, A&R has adapted to trucking industry competition by increasing its transloading business. The short line teams with CSX and NS to move freight to transload facilities on each end of the railroad. The short line's future depends largely on its success in continuing to foster economic development in the region, A&R officials said. The railroad long has played an instrumental role in helping attract and develop industries in southeastern North Carolina, according to local officials.